In the upcoming weeks, DC Water will be placing unique identifying numbers on the placards already embedded in the concrete. We’re almost done! Construction of permeable pavement facilities in 19 alley segments throughout Burleith was completed in mid-March. Now contractors for DC Clean Rivers Project are performing functional testing as well as punch list items ranging from placing ID placards on the green alleys to making minor repairs. DC Water’s Amanda Zander, Green Infrastructure Public Outreach Coordinator and Private Space Implementation Coordinator, has been keeping the BCA and ANC 2E commissioner Kishan Putta apprised of progress and expects the work to be totally finished by the end of April. Engineer-of-record Eric Lienhard (left) floods a portion of the alley to see if water is properly draining through the pavers. Photos by Ann Carper. The testing conducted includes flooding each of the cells to ensure that they are retaining water, the valves are properly functioning, and that the facilities drain back into the sewer system within 48 hours. Additionally, the team verifies that the pipes and fittings are sealed properly and do not leak. They verify this by snaking a Closed-Circuit TV (CCTV) camera down each cell’s manholes. Lienhard and contractors watch as a camera is threaded down through a manhole into one of the cells. An earlier surface infiltration or “ring” test involved putting first a gallon of water within a 12”-diameter ring on the pavers and seeing how long it took for the water to disappear, followed by five gallons. 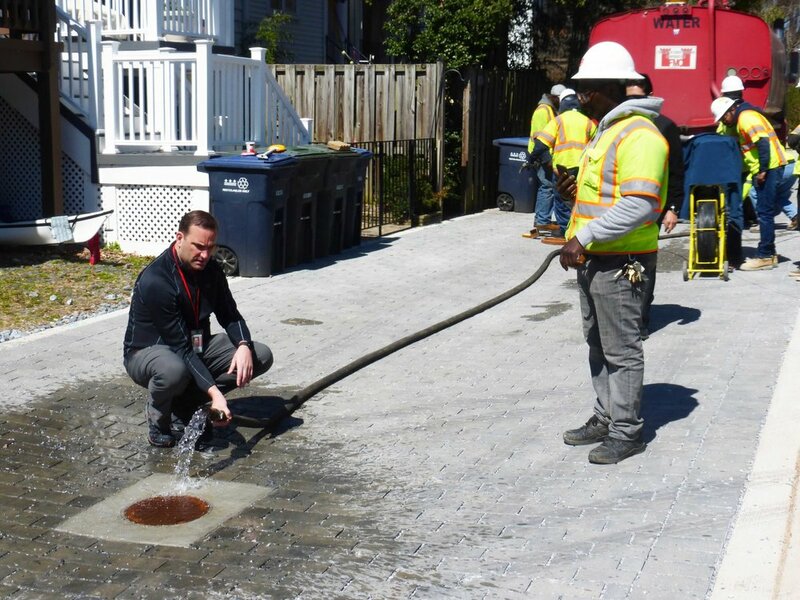 This allows DC Water to confirm that the stormwater will penetrate the surface of the alley and not pond on the surface. Once all of the post-construction activities are completed, monthly maintenance on the alleys will be conducted. A regenerative air machine to sweep the alleys and dislodge debris that could interfere with water permeability with be driven through the alley, similar to the machines seen sweeping the streets. These monthly sweeps will take place from March through December. While on site, the contractor will inspect to see that water is being properly released into the sewer system. If residents notice problems between sweepings, they should use the contact info and location number on the placard to contact DC Water. Lienhard peers through the monitor of a CCTV to observe conditions underground. In addition to the on-site work in our neighborhood, DC Water is also writing the practicability report, which is required by the consent decree between the US EPA, US Department of Justice, the District of Columbia, and DC Water. The report will document whether green infrastructure is providing the benefit anticipated in helping to reduce the combined sewer overflows (CSOs) into the Potomac and Anacostia Rivers and Rock Creek. The report also considers constructability, operability, efficiency, public acceptability, and cost per impervious acre treated. Despite the months of construction and inconvenience, the green alleys look great, and Burleith can feel good about doing its bit to improve the health of the Potomac River. This November 2019 photo shows one “cell” extending from manhole to manhole.